The Holy Trinity Badminton Club play system uses a game board, consisting of taped lines, representing the 6 courts, and tags, representing the members present at the club, to indicate which members are playing on which court. There will be an exec arranging games, calling a court change every 15 minutes, and everyone will rotate on (or off) of the courts. The games will be arranged by level and gender with the intention of members experiencing a variety of games, interesting games, and an equal/fair amount of play time. Upon payment of a member's registration, a tag will be created with the member's name, level, and gender on it. When an exec places a tag onto the court map, this means that the member has been chosen to play on the next court change. All tags that are not on the court map represents the players to sit off the next court change. 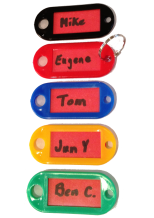 When 2, 3, or 4 members wish to play together, they are permitted to clip their tags together and they will be arranged onto the same court, the next court change. All members finished for the day, must put their tags back into the storage container. If you're actually reading this section, then thank you! The gym rules are too often broken and have jeopardized the safety of those on and off the court. The most important rule is DO NOT walk across courts in play. This includes, not cutting across corners of the court, to save you milliseconds of time. Those walking across courts can be seriously injured by a swinging badminton racket. If a game is in play, do not walk behind the court, until the play has stopped. If you are a parent with small children at the club, please teach them this rule first. A child hit in the head, by a swinging racket, can be catastrophic. All members are expected to wear proper athletic clothing, and appropriate non-marking footwear. Playing in jeans, in socks only, barefoot only, sandals, or any other similarly dangerous get-up will result in a spanking and kicked off the courts for the day. Foul language will not be tolerated, period. The first time a member (or guest) is caught, will result in their mother being notified and a soap scrubbing of the filthy mouth. If foul language persists, their membership will be revoked and a letter of apology to the club will be required. Food and drinks are only permitted at the cafeteria tables, if they do not smell too strong. Bringing food for all of the club members to share is encouraged; such as, a large basket of grapes. At the end of each game, politely shake hands. A handshake is a sign of respect and a thanks to your opponents for helping you get better at badminton. Remember, no one has become the best by only winning - playing stronger opponents is how you get better. Lastly, assist setting up and taking down the badminton nets each club session. Thank you for reading the gym rules! You deserve a cookie.